The Series 6 family of high-performance Microsemi Adaptec Unified Serial (SATA/SAS) RAID controllers offers maximum performance, scalability and flexibility. With the enhanced bandwidth of its 6 Gb/s SAS2.0 interfaces and the PCIe Gen2 host connection it offers up to 60% higher sustained sequential throughput than previous generation controllers. Based on Microsemi's market-leading, multi-core SRC 8x6G RAID-on-Chip (RoC) the Microsemi Adaptec RAID 6405 can deliver up to 2 GB/s sustained data transfer rate to the host. Peak performance is up to 4.8GB/s through the SAS 2.0 interfaces and 4.0GB/s through the PCIe Gen2 host interface. 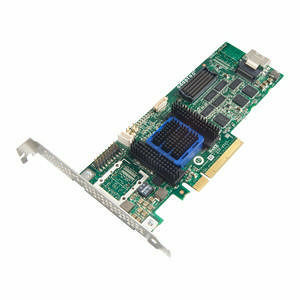 Using SAS expanders, it can connect up to 256 SATA/SAS. The Microsemi Adaptec RAID 6405 supports a broad range of operating systems, compatibility with more than 300 third-party devices, and full integration with Microsemi Adaptec Storage Manager for centralized management of all Microsemi Adaptec RAID controllers on the network.